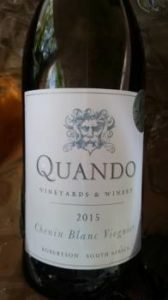 Over the weekend, I tasted a selection of wines from Robertson property Quando and was impressed with the overall quality relative to price – the Sauvignon Blanc 2015, which sells for R60 a bottle, is not too green and makes for a perfectly pleasant aperitif (86/100) and the Mourvèdre Rosé 2015, R50 a bottle, is fruity and fresh with notes of strawberry and spice (86/100). The stand-out wine is the Chenin Blanc Viognier 2015, the blend incorporating 71% of the former from vineyards over 30 years old and 29% of the latter. Unwooded, it shows white peach and yellow apple but also a touch of earthiness. Medium bodied, the finish is very savoury, even a little bitter. Great drinking at R55 a bottle.